Often we see visitor counters at stadium, mall, offices, class rooms etc. How they count the people and turn ON or OFF the light when nobody is inside? Today we are here with automatic room light controller project with bidirectional visitor counter by using Arduino Uno. It is very interesting project for hobbyists and students for fun as well as learning. The project of “Digital visitor counter” is based on the interfacing of some components such as sensors, motors etc. with arduino microcontroller. This counter can count people in both directions. This circuit can be used to count the number of persons entering a hall/mall/home/office in the entrance gate and it can count the number of persons leaving the hall by decrementing the count at same gate or exit gate and it depends upon sensor placement in mall/hall. It can also be used at gates of parking areas and other public places. This project is divided in four parts: sensors, controller, counter display and gate. The sensor would observe an interruption and provide an input to the controller which would run the counter increment or decrement depending on entering or exiting of the person. And counting is displayed on a 16x2 LCD through the controller. When any one enters in the room, IR sensor will get interrupted by the object then other sensor will not work because we have added a delay for a while. There are some sections of whole visitor counter circuit that are sensor section, control section, display section and driver section. Sensor section: In this section we have used two IR sensor modules which contain IR diodes, potentiometer, Comparator (Op-Amp) and LED’s. Potentiometer is used for setting reference voltage at comparator’s one terminal and IR sensors sense the object or person and provide a change in voltage at comparator’s second terminal. Then comparator compares both voltages and generates a digital signal at output. Here in this circuit we have used two comparators for two sensors. LM358 is used as comparator. LM358 has inbuilt two low noise Op-amp. 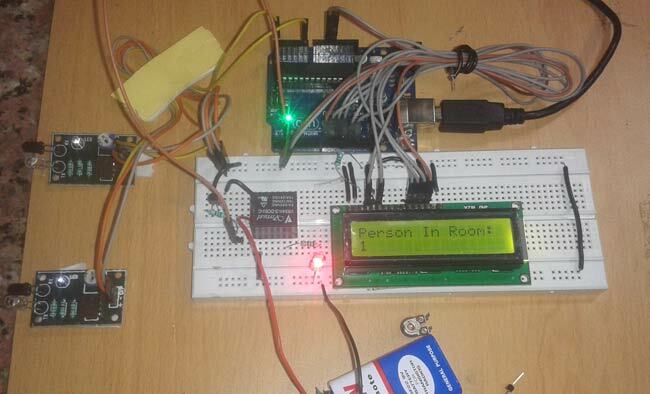 Control Section: Arduino UNO is used for controlling whole the process of this visitor counter project. The outputs of comparators are connected to digital pin number 14 and 19 of arduino. Arduino read these signals and send commands to relay driver circuit to drive the relay for light bulb controlling. If you find any difficulty in working with relay, check out this tutorial on arduino relay control to learn more about operating relay with Arduino. Display section: Display section contains a 16x2 LCD. This section will display the counted number of people and light status when no one will in the room. Relay Driver section: Relay driver section consist a BC547 transistor and a 5 volt relay for controlling the light bulb. Transistor is used to drive the relay because arduino does not supply enough voltage and current to drive relay. So we added a relay driver circuit to get enough voltage and current for relay. Arduino sends commands to this relay driver transistor and then light bulb will turn on/off accordingly. The outputs of IR Sensor Modules are directly connected to arduino digital pin number 14(A0) and 19(A5). And Relay driver transistor at digital pin 2. LCD is connected in 4 bit mode. RS and EN pin of LCD is directly connected at 13 and 12. Data pin of LCD D4-D7 is also directly connected to arduino at D11-D8 respectively. Rest of connections are shown in the below circuit diagram. First we have included library for LCD and defined pin for the same. And also defined input output pin for sensors and ralay. Then given direction to input output pin and initialized LCD in setup loop. In loop function we read sensors input and increment or decrement the counting depending upon enter or exit operation. And also check for zero condition. Zero condition means no one in the room. If zero condition is true then arduino turn off the bulb by deactivating the relay through transistor. And if zero condition is false then arduino turns on the light. Here is two functions for enter and exit. do the same circuit sufficient for your new program??? Sir what exactly does your modified code do? And how did you implement it physically like did you place two sensors at the same door at some distance to track the count? Also, can the sensors be deployed vertically on the ceiling instead of horizontally? And how did you implement it physically like did you place two sensors at the same door at some distance to track the count? Also, can the sensors be deployed vertically on the ceiling instead of horizontally? if two persons enter at the time, can this circuit count the correct number. Hi, wonderful project idea and demonstration, I have bought all the required components, however I wish to use LED or an array of LEDs in stead of 220v AC bulb, what should I do to make it work? Like in your video I see a relay is attached to the breadboard, however I am bit confused about LED, should I directly connect LED in place of bulb(bad idea?) or relay? @Andrews @BRAHMAREDDY @Abhishek: Learn More about how to use relay here. I mean exactly On the contrary of this program when the IR module didnt get any IR signal instead of getting signal ? can i change ir to pir ?if i change then what need to change in ckt or programming/? Your project is really amazing. I would like to build it myself just to have some hands on experience. Could you please tell me what ohms are your resistors? and you have connected the circuit to the diagram as shown above? hi....am ajit ...i almost done this project according to your above details...but unfortunately there is a problem.i did not able connect the relay with load ....plz give some idea about it. Please read all the previous comments before asking questions, we might have answered them already. do you know whatvis the maximum range og this ir sensors? Normally the range of IR LED is 2 meter, but it can be increased by using Lens. Can you please give me a suggestion for how to make the same code for pic? this program is not working its show error in compilation ???? I have created a new version on this project for my first semester final project. Intially idea i get from this web then worked on it finally i made it . My version is more sensible and i have used direct incidence of ir sensor . These direct incidence sensor could be made at home very easily . if any body want any help regarding this project he may ask. As you expressed to help us,please provide your modified arduino code for automatic room light controller using arduino and seven segment display. Sir I am in need of using the sensor range for about 3-10 ft for sensing range. So I have decided to use ultrasonic sensor for that range of measurement. Can i use ultrasonic sensor for this project? if not can you suggest me any other sensor? while doing this experiment the problem that i am facing is in my lcd continuously no. of person is getting changed in absence of any input. That means when i bring my hands near to the either of the sensors it performs according to the porgram but the moment i am removing my hand(that means there is nothing to be sensed) lcd starts showing an infinite loop of 0 and 1 and it continues untill i again bring my hand near sensor. i have checked the connections .. they are correct..
but when i give an input like move my hand across the sensor, the screen goes blank and comes back on when i remove my hand..
plz tell me what to do..
i have a week before i have to submit the project and its too late to change it. how you can limit the peaple in the room for example if you want only 10 peaple in the room ,which code you can use it. I did it and it works very well. But the sensors you used are small range detector. How much Your sensors range can detect? Please give the whole code for this project. hello admin is this the correct code or we need to alter something?????? I am new to Arduino. I have given the same circuit connection and uploaded the program. but the counter is changing between 0 and 1 automatically. Where i have done mistake. how to find? The Red led on my sensor module is always on standby. when we put our hands near the module the LED BLINKS AND AGAIN TURN ON. Some times the number of persons simply goes on increasing or decreasing. I doubt it is not working according to the sensor input. Please look into my problem, I want to submit the project within 2 days. please send me the corrected code which worked for you. I have connected a Led instead of the Relay but the Led Keeps blinking even when there is no count. What is the voltage of the chargable battery? Can we add PIR Sensor along with IR sensor to this project. IR sensor for counting the persons and PIR Sensor for turning on the light on particular area in a large area/hall. So can we use PIR And IR sensor in this project. If it is possible can you explain me how can we do it. Thank you Aisha, Your idea was the solution, where the threshold of the IR input was crossing continuously. Adding 10 K resistor in series with the IR sensor worked. by the way great project and thanks for everyone contributing to this. Sir , i need the entire circuit of above showed video of automatic room light controller. Will u please say about the maximum distance provided between 2 ir modules. And also gave the connection to the 5v relay . how can i send the data of no. of persons in the room using mobile phone? how can i add a limit for no. of persons to enter into the room and also voice alarm if count exceeds? They are not LDR, it is IR sensor. Read the complete explanation patiently. hay sir good day.. the arduino ide needs an drivers to run ?? The code count the also update the person in negative value so try this code. I have trouble in output in LCD display plz advice me connection properly . How to add IR Module in proteus software? My lcd display is not getting output it is seen blank.not a seen count or any output in lcd display pls help me what is solution of this. Problem in Lcd diplay output.nothing getting cursor in lcd. I've made all proper connections and even the LED's and sensors are working perfectly, but the LCD doesn't show anything even though it is ON. Sir Send me the total components list with there values and how many components are need. Can you post a video about all the connections in detail ? This is my first Arduino project attempt. I've tried to reduce some part of the code to eliminate the LCD display part. Can anyone tell if the following code is correct? digitalWrite(relay, HIGH); Then low again to simulate a push control. Sir pls send me the "correct" or updated source code for counting the people. I try the source code that mentions in the previous source code but it won't works.